The 2017 Ford Fusion is one of the most versatile sedans available at Van Isle Ford. Because it comes in twelve unique trim levels, there is a 2017 Ford Fusion Sedan for every type of driver imaginable. These include the entry-level S, Titanium, Platinum, three hybrid trims, and even the plug-in Energi Platinum. The experts at Van Isle Ford believe all drivers in Mid Vancouver Island need to learn more about this outstanding and affordable sedan car. The multiple engines available for the 2017 Ford Fusion all offer outstanding performance and efficiency. You start with a standard 2.5-liter I-4 i-VCT engine that produces 175 horsepower at 6,000 rpm and 175 lb.-ft. of torque at 4,500 rpm that gives you a combined 11.5 L/100km in fuel efficiency with all-wheel drive. On other trim levels, you'll enjoy the 2.7-liter EcoBoost V6 that features a six-speed SelectShift automatic transmission and puts out an impressive 325 horsepower at 5,500 rpm and 350 lb.-ft. of torque at 3,500 rpm. For those who demand the highest level of efficiency and want to do their part to protect the environment, there is the 2.0-liter Atkinson-Cycle I-4 Fusion Energi Plug-in Hybrid Engine. It produces 141 horsepower at 6,000 rpm and 129 lb.-ft. of torque at 4,000 rpm and will give you fantastic fuel efficiency with 2.4 Le/100 km and 5.6 L/100 km combined with gas only. To give you outstanding control, the 2017 Ford Fusion can be had with a number of different transmissions including six-speed automatic, six-speed SelectShift Automatic with Paddle Shifters, and an E-CVT Automatic. To keep you and your family as safe as possible, the 2017 Ford Fusion received an overall five-star rating from the NHTSA. packed with the latest safety features. You get front and rear head airbags, four-wheel anti-lock braking system, passenger airbag occupant sensing deactivation, rear inflatable seat belts, dusk sensing headlamps, a post-collision safety system, and auto stop-start technology. 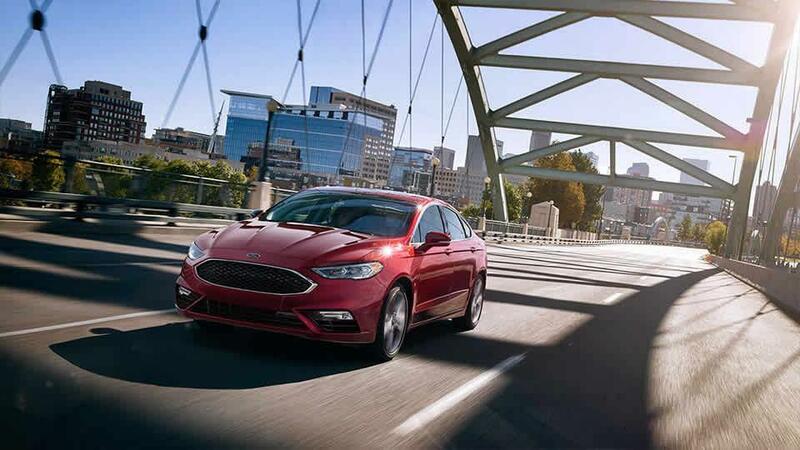 If you want to experience the 2017 Ford Fusion Sedan for yourself, we suggest contacting the sales and service experts at Van Isle Ford to schedule a test-drive today. The Van Isle Ford team is here Monday-Saturday from 8:30-5 (8 am on Friday) so there's plenty of time to drop by our centrally located dealership at 4831 Beaver Creek Road, Port Alberni, BC.